You are here: Home / Featured Articles / Mac Trailer Parts Dealer of the Month! Mac Trailer Parts Dealer of the Month! The Martin family and MAC Trailer have a relationship that dates back to the beginning of MAC Trailer! Martin’s Truck Parts was the first dealer to take on the MAC Trailer product and we never looked back. MAC Trailer’s quality and service is second to none! Our family takes pride in knowing that we do everything possible to provide our customers with unmatched service, outstanding parts availability, and competitive pricing. It is great to partner with a manufacturer that has the same goals! 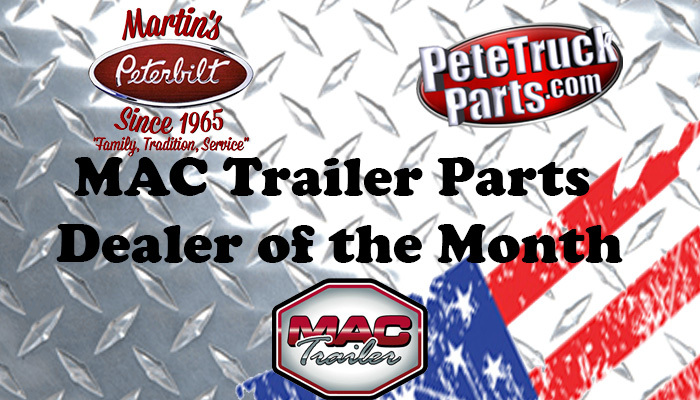 We, at Martin’s Peterbilt and PeteTruckParts.com, thank MAC Trailer for their partnership over the years. Check our New and Used Trailers out in the links below. Click the links below to check out our MAC Trailer Parts line and other trailer parts inventory.